These pages and tutorials will introduce you to the exciting world of electronic circuit design. The possibilities range from electronic games and light circuits to home automation and robotics. Whilst we won't go into too much in the robotics area this will provide the basic building blocks used in the electronic circuitry used to drive robots. It will include some projects using electronic circuits that can be made at home. The projects and examples include some based around the Arduino Microprocessor based controller and some using discrete components. I have also published a book teaching electronics through fun projects interfacing with a Raspberry Pi. So if you want to know how to control a Lego train, create your own Minecraft joystick controller or create your own Raspberry Pi robot, then it may be what you are looking for. Not only will you get to make those projects, but you will learn about electronics on the way. 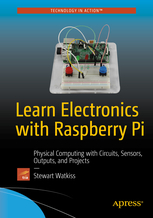 It's available from most book retailers "Learn Electronics with Raspberry Pi", by Stewart Watkiss. Or click below for more information. This web site is not directly related to the book, but they should complement each other well for anyone setting out learning about electronics. The examples and descriptions on this web site focus on the practical side of electronic circuit design. The descriptions of how the individual components has been kept to a simple level describing the function of the components rather than the details of how they work in terms of electron flow. The physics involved in looking at how the individual components works can be quite complicated and is left for the reader to read up elsewhere. The maths kept to the minimum required to design the circuit, although inevitably some maths is essential to the design of electronic circuits or can be useful to help understand what is happening. Most of the designs focus on digital electronics. This is the field of electronics that interests me most and is easy to implement and interface with a computer. In the real world there is often a necessity to interface to the outside which often involves provide an analog output to drive a device or measuring an analog input which I have of course included. I have particularly chosen to avoid op-amp circuits and such like. There are many other sources of information for building your own amplifiers or analog feedback loops if that is what interests you. I have taken a modular approach to designing some of these projects so whilst they can be reproduced in their entirety the real flexibility comes from taking the modules and connecting them in different ways, or in the case of the Arduino, by experimenting with programming the Arduino to change its behaviour.